A flying bridge yacht where Azimut concentrated its experience to contain costs, weight, consumption and optimize the quality/price ratio. The visit and the sea trials of this flying bridge yacht are especially interesting because she was "born during the economic crisis" and it is apparent how the building and commercial experience of a yard like Azimut accounts for obtaining the ideal quality/price ratio with a special concern for consumption. First of all, two different types of hull without substantial structural changes may be built using the same basic mould. Common elements - such as cabin floors, galley, saloon, helm station - are maintained in addition to the engine room in which the same engines may be set for different needs: for higher speed in the case of the sporty open 40 S model, for moderate speed in the case of the 38 Fly model used in the sea trials. 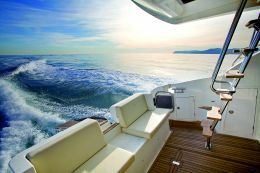 Lamination is carried out by Azimut's Turkish partner in a traditional manner as per Italian specifications and using materials that guarantee an osmosis-free hull for 5 years. Even the transmission, the chosen one is traditional and tested, allows reduced costs and safe performance. Another interesting solution is AMX Proteo, the digital switching management system that allows considerable energy savings. The soft start or the interlock start functions, for example, avoid the simultaneous starting and operation at maximum speed of the various electric motors, thus preventing absorption peaks. Immediate advantage? A 7kW instead of a 9kW generator is sufficient, with consequent saving in weight, fuel, etc. 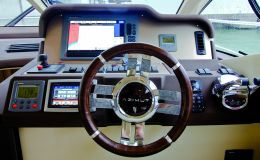 Even interconnection of Vessel View, generator and GPS chartplotter optimizes consumption on the basis of incidental needs. 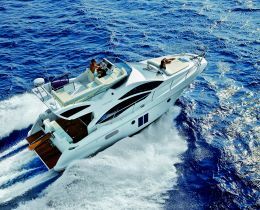 In short, the two "dinky" Azimut models, even though "entry level" yachts, do not lack anything. 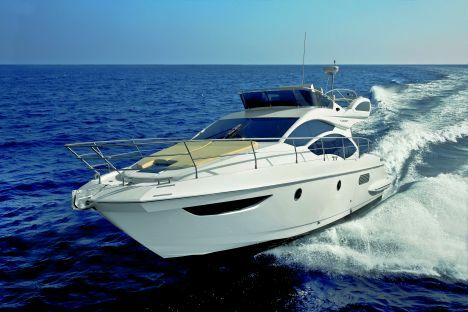 During sea trials, the 38 Fly showed excellent and fluent seakeeping, a feature that is evident in M. Peters - designer of the Cabo fishermen - models, and a good living space which combined with the family feeling created by the materials and the design, gives an immediate sense of belonging to the Avigliana fleet. Price with standard equipment and test boat power engines: Euro 320,000.00 + VAT. Hull and superstructures construction: the hull is in traditional and monolithic laminate, the superstructures and hull sides are in sandwich core, outer layer in vynilester resins and structures in orthophthalic and isophthalic resins. Helm station: on a higher level to starboard of the saloon, with window with lateral opening and small hatch opening on the flying bridge, seating for two, locker, Vessel View display for checking data of Cummins engines (rpm, pressure, voltage, consumption, etc.) and of other yacht data, Tridata, Raymarine C140, controls and flap indicators. Layout and characteristics: interiors are in veneered faded oak, fabrics are in natural and synthetic fibres. Door surfaces are simple and upgraded by new designer knobs; sofa, helm station seating, bed surrounding panel and details are in leather. 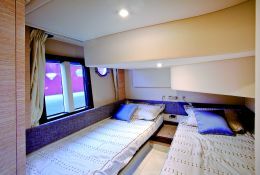 The master stateroom lies forward with double bed, headboard in fabric, surrounding panel in leather, LED reading light, opening portholes, hanging cabinet, locker beneath the bed with double access. 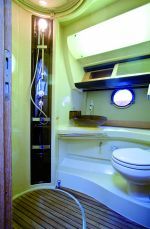 The bathroom floor is in teak, the sink is in synthetic (transparent) resin, the cabinet has a sliding mirror, the round shower stall has integrated light and skylight on main deck, the electrical WC is fitted with a waste treatment system. The guest cabin is to starboard with twin beds, it is fitted with a double 14mm composite glass window and an opening porthole, a hanging cabinet with cedarwood interior, a bedside table with locker and drawer and a locker beneath the floorboards. The bathroom has fittings similar to the master stateroom bathroom, it has a wider walkable floor area and an opening porthole, but no skylight. A removable floor portion facilitates inspection and replacement of the grey water tank where grey waters are collected by gravity. 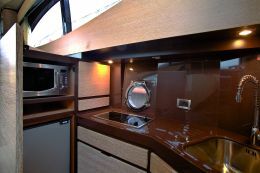 The galley, at the foot of the companionway steps, has oak floorboards and is fitted with a resin worktop (an imitation of the bigger models), a stainless steel sink with water mixer and thermostatic mixing valve, a microwave oven, a 130-litre refrigerator/freezer, lockers, drawers with a double retention system for cutlery etc., an opening porthole. 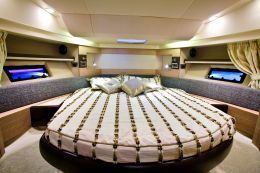 In the saloon, the dinette lies to starboard, with an L-shaped sofa convertible in bed (optional) and a wooden/glass fold-out table that may be taken outside if needed. 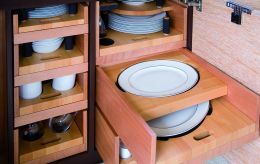 Opposite, there is a cabinet for storing the tableware and anything, the AC air outlet and the space for the TV set. Optional: 4kW or 7kW generator, 32kBTU air conditioning (7kw generator is required), heating, bow thruster, joystick control, TV set, navigation electronic instruments (package with Raymarine 140C or 120C), teak on deck, flying bridge and cockpit. Maximum speed at 3,050 rpm: 30.6 knots. Docking maneuverability: good, the joystick control coordinates bow thruster and engines for easy maneuvering. 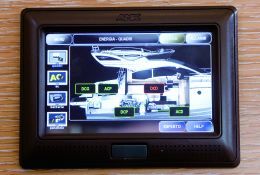 Electrical panel and wiring: for optimal consumption, the AMX Proteo management system controls parameters and systems with digital switching on bus line, display in galley and alarm repeaters on dashboard; 4kW or 7 kW generator, 220V/30A shore power fitting, 50A/24V battery-charger, 4x24V/90Ah service batteries, 2x24V/90Ah engine batteries, manual control panel of the Proteo System switches in guest cabin.